The success of the Jodel DC1 lead M. Delemontez to make a thorough revision, and the first D-18 took to the air in the spring of 1984. At first glance looking quite similar to the DC1, there is hardly a single point where Delemontez has not checked, thought and more often than not, changed something. The prototype has a slightly bigger span than the DC1, and weighed 243kg empty. MTOW is 460kg. 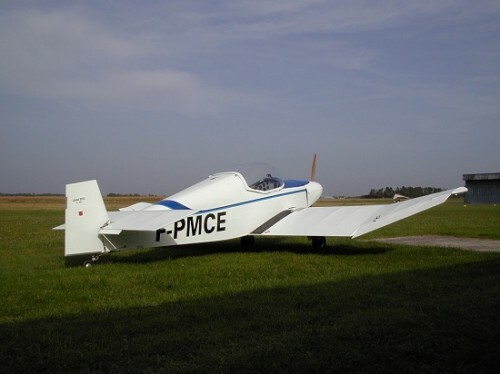 In the 13 years that passed between the prototype's first flight and the summer of '97, SAB had sold approximately 470 licences. This should mean about 35 sold pro year. And if you use EAA's statistics saying about 15% of homebuilts are completed it should mean about 70 are currently flying. The straightforward construction of the plane should indicate that more of them are flying however. Like all other Jodels the D18 is built entirely of wood. Even compared to other wooden airplanes there is incredibly little metal in a D18. Beside the engine most of the metal is in the undercarriage. Primarily aimed at being powered by a 1700cc Volkswagen conversion, the D18's are powered by a multitude of powerplants. Different VW conversions, Limbach engines, JPX'es of different sizes and last but not least the Australian Jabiru engine. Rotax 912/914 should also be good engines for the D18. range Limbach EO2X L2000. 80 hp at 3,400 rpm.